The problem of ensuring information security has become ever more challenging as both volume of information and use of third parties who touch critical information has grown. Cyber attacks are said to have cost businesses more than $400 billion last year alone and it is estimated that two thirds of those attacks were perpetrated on and through third parties handling company or customer data. Managing the process of verifying, remediating where necessary and monitoring the effectiveness of third party controls demands the use of sophisticated and mission-designed technology. 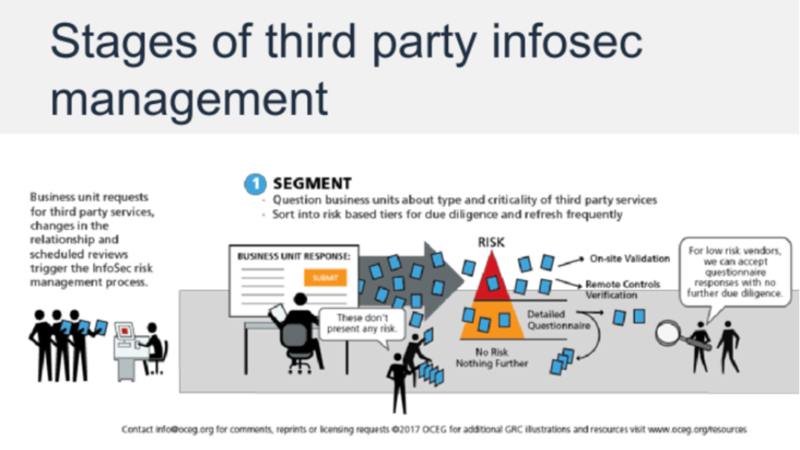 In this webinar, we defi ne the key steps of the process and identify what the future holds for third party information security management. Steven Minsky, CEO, LogicManager, Inc.
We have emailed instructions to access The Challenge of Third Party InfoSec Risk Slide Deck to . Make sure the email arrives in your inbox: either add "support@oceg.org" as a safe sender to your email platform, or if you use Gmail, drag our email into your Primary tab.